Writer Joel Stein sat in on USMC visiting professor Sam Tanenhaus’s class on Trump for Vanity Fair. These students are from the first generation steeped in reality TV, Twitter, memes, and GIFs. They are immune to Trump Shock, a trait which allows them to coolly analyze the first president to grab the levers of those media. Reporter Steve Paikin of TVO’s ‘The Agenda’ visits the final session of Tanenhaus’s “Trump and the Media” course to discuss politics and journalism careers with students. Photo by Michael Czobit. This is not the first major media attention “Trump and the Media” has elicited. 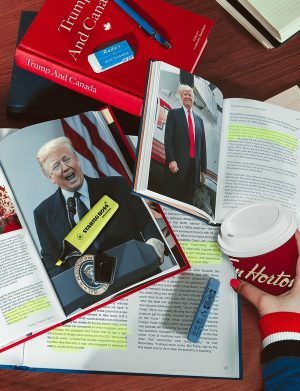 In fact, in an ironic turn, American and Canadian media alike paid a great deal of attention to Tanenhaus throughout the fall term for his agile approach to teaching U of T students about the ways and means of the divisive American president. 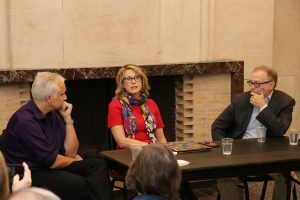 USMC visiting professor Sam Tanenhaus (right) participates in a PEN Canada panel on the killing of Saudi dissident journalist Jamal Khashoggi. Photo by Martyn Jones. You can listen to Tanenhaus discuss his reasons for coming to Toronto to teach the course in this CBC Radio clip from September, or watch him in this classroom in this video clip from CBC’s The National before the U.S. mid-term elections. An October Globe and Mail article detailed Tanenhaus’s experiences of getting in touch via text message with Steve Bannon, a major player in Trump’s rise to power. In November, a reporter for Vice News found students making plans to pursue journalism careers, with many course-takers longing for longer class times than the customary two hours. 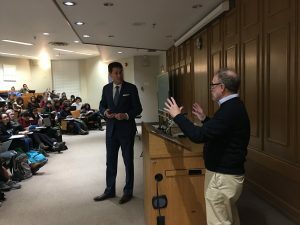 At the end of that month, reporter Steve Paikin of TVO’s The Agenda visited the final meeting of Tanenhaus’s class to discuss Canadian and American politics, the future of the journalism industry and what today’s careers in journalism look like. In December, Tanenhaus joined a PEN Canada panel in Charbonnel Lounge on the St. Michael’s campus to discuss the murder of Saudi dissident journalist Jamal Khashoggi and its implications for journalists around the world. The cover story Tanenhaus wrote for TIME magazine while teaching at St. Mike’s. Tanenhaus has maintained a busy freelance journalism schedule in addition to his teaching commitments. 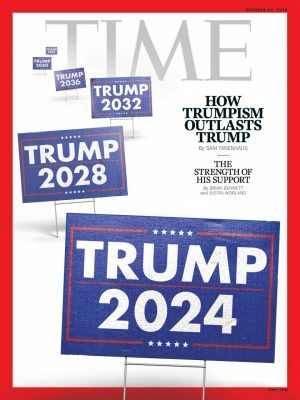 One of these projects became an October cover story for Time magazine on the attempts of some Trump supporters to turn the president’s ad-hoc declamations and public statements into a durable political movement. Without a doubt the highlight of my experience at St. Mike’s was spending time with great students. [They were] engaged, eager to talk and to listen, extremely well informed, scary smart, and in some cases, brilliantly gifted. Anyone harboring worried thoughts about millennials should spend a couple of hours talking with U of T undergrads, and the fog will almost instantly lift. It is to our great benefit that even though Tanenhaus concluded his teaching at St. Mike’s in December, those students are still around.